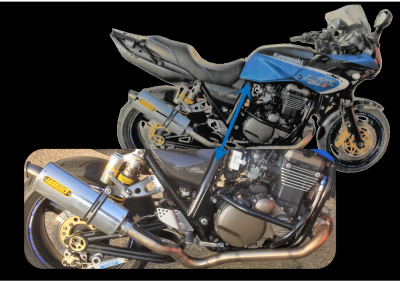 Turbo kits, for most machines from 900cc, are designed and built within our workshop and are tailored to meet the relevant specification of each motorbike and, where practicable, the requirements of the customer. 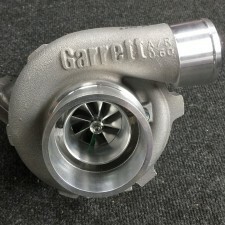 During consultation, we will discuss variants such as the the turbo being side or front mounted, whether the system is "draw through" or "blow through" (the latter being more efficient and appropriate for road use), exhaust systems, dump valves, whether internal or external wastegates are incorporated and of course discuss the range of turbochargers available, dependant on budget, from low budget turbos (suitable for low boost/road use) to those units considered top of the range from the likes of Garrett and Borgwarner. We will then talk you through the project and provide you with a written quotation and estimated timescale. A bespoke Turbo System was built for this ZRX, running on the stock engine with pair valve system removed. 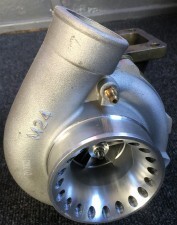 The Turbocharger is a GT25/60 with built-in wastegate running 7lb of boost. The end product produced 208 bhp at rear tyre and 101 ft/lbs of torque and a very happy customer!